Applications for remote participants in MANILA are due June 30, 2017. 6 European University Credits (ECTS) are available for this design studio. Outside Europe, credits are transferrable at the discretion of your home institution. For the Philippines, CPD professional units may be available (application pending). SITREP.at LISBON Summer 2017 in MANILA tuition is € 480. CREATION of a novel set of data by collecting and analyzing the “soft”, latent information underlying the changing conditions, user-ship, and programmatic malleability of selected plazas in Lisbon. IDENTIFICATION of the data’s associated architectural and urbanity devices, especially as they pertain to the potential to expand both the porosity (hardware) and accessibility (software) of informational-social complexes such as Lisbon’s public plazas. DEVELOPMENT of design proposals incorporating the above data set and devices to transform the selected public plazas into Civic Forums. SITREP.at LISBON Summer 2017 will be hosted by the Centro de Informação Urbana de Lisboa and the Lisbon Municipality (CIUL-CML), using the Doca de Santos on the Lisbon waterfront as a case-study, in conjunction with the Instituto Superior das Ciências do Trabalho e da Empresa-Instituto Universitário de Lisboa (ISCTE-IUL). Instruction will be conducted by Carla Leitão, Philippe Baumann, and Michael Su, together with lecture and seminar collaborations of staff from the CIUL-CML and faculty from the ISCTE-IUL. 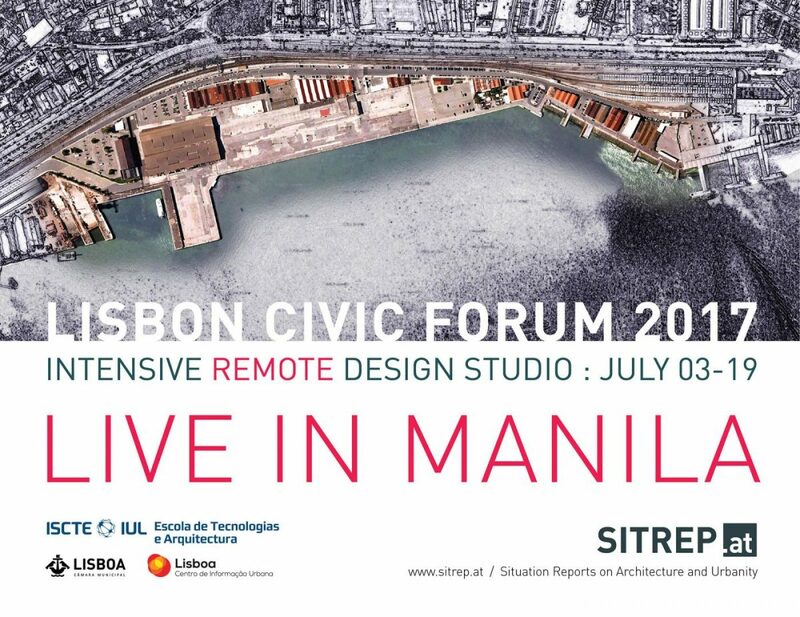 SITREP.at LISBON Summer 2017 in MANILA is a remotely operated design studio, which will operate simultaneously with the LISBON studio at a location in Metro Manila. 6 European University Credits (ECTS) will be available for this design studio, which may be transferred to your local institution. As well, CPD professional units in the Philippines may be available (application pending). Keynote lecture on Lisbon by special guest. Daily topical lectures by Lisbon experts and studio instructors. Virtual studio reviews on research and design with studio instructors. Skills/techniques/software instruction in virtual seminars. Autonomous, open studio time for readings and research/design exercises. Virtual Public Review and Exhibition of studio work. This remote design studio consists of daily, live-streamed and interactive lectures from the simultaneously operated Lisbon on-site design studio. Through daily lectures and the completion of research and design exercises, the remote studio aims to contribute to the on-site studio’s development of context- and problem-specific proposals for creating a Civic Forum in Lisbon. At the end of the studio, these proposals will be presented at a public Design Review and Exhibition, and eventually incorporated into a Situation Report. Live-streamed keynote lecture by a special guest. Live-streamed and interactive daily lectures by experts and professors. Live-streamed and interactive seminars on specific skills and techniques. Open studio days for in-house work. Live-streamed and interactive final public review and exhibition. Co-authorship in resulting Situation Report. Academic recommendations and professional networking. Portfolio of work produced during the studio. 6 ECTS European University Credits, which may be transferred to your local institution. CPD professional units in the Philippines (application pending). Detailed list of Keynote Speaker, Lecturer, and Seminar and Workshop Directors will be distributed to accepted participants separately. The location of our remote MANILA design studio will be FIRST Space, a dedicated workspace conveniently located on Escolta Street in Metro Manila, in units 502 and 506, in the First United Building. For more information, please see FIRST Space (or read this CNN article). We would like to express our appreciation to FIRST Space for their generous support of this, our first remote design studio in Manila. Please be sure to read the Frequently Asked Questions on SITREP.at design studios on our Application page.